Acronis, Exabytes & M-Link Partnership - Award-Winning Backup Solution! Home Exabytes Events Acronis, Exabytes and M-Link Partnership to Offer Award-Winning Backup Solutions! Acronis, Exabytes and M-Link Partnership to Offer Award-Winning Backup Solutions! Last weekend was an important milestone for Exabytes. Acronis announced the appointment of M-Link System (M) Sdn. Bhd. as Acronis’ master distributor, and Exabytes as its designated Cloud Service Provider (CSP) In Malaysia. Exabytes is proud to provide its reputable technical expertise in offering local cloud storage capacity and support. Acronis provides award-winning backup software and data protection solution for consumers and business of all sizes. Their hybrid cloud data protection provides the best backup solution, disaster recover, secure file sync and more. In conjunction with the partnership, Exabytes will be providing more sophisticated and advanced backup solution to its valued clients. Stay tuned to our home page for the exciting product launch! 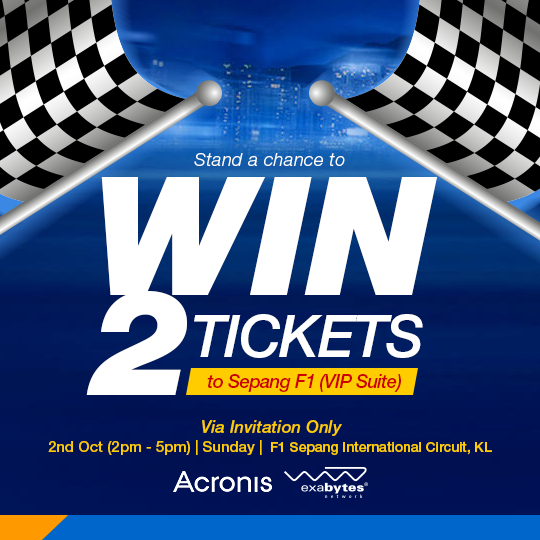 Once again, we at Exabytes thank Acronis for giving us free tickets to witness the exciting F1 race. It was indeed a fantastic experience! Besides the 7 attending Exabees, we at Exabytes were proud to giveaway 4 FREE tickets to our valued clients, who only needed to share their own personal experience about data loss on Facebook in order to stand a chance to win the FREE tickets. This partnership between Acronis and Exabytes marks an important milestone for the offering of our professional web hosting services in Malaysia. Security and backup are always our primary focus when it comes to providing web hosting services to our valued clients. At the same time, we’re excited that Acronis also provides backup solutions for mobile phone users, apart from enterprise server backup. Our CEO, Mr. Chan Kee Siak is given speech during the partnership announcement. The partnership kick-started at Sepang International Circuit after Acronis signed a long-term partnership agreement with Scuderia Toro Rosso, which is one of the F1 teams. Our guests enjoyed the experience to witness the blazing speed of F1 race tremendously. The Exabytes team at Acronis Racing Weekend. See Acronis – Exabytes Product Launch for more exciting event photos! *You might find yourselves in the album if you’re attend this events! Previous articleWe’re Giving Away FREE Web Hosting at #MyCybersale 2016!